Watch the video "Mystery of the Yellow Bulbs: Caterpillars, Ants & Parasitic Plants"
Some sort of fungus? That was my first thought. After all, I've seen tons of strange looking fungi in the Amazon by now. But something about these yellow bulby-looking things piqued my curiosity, so I walked up to take a closer look. Inspecting them closer only made things more confusing. They didn't really look like fungi, at least not like any I had ever seen before. Was it a fruit produced by the tree? Plant lenticels? I started to take some pictures. A closer look at the mysterious yellow "bulbs"
That's when I noticed something really interesting. As I scanned the tree's alien protuberances, my eyes locked on to something I wasn't quite anticipating: caterpillars! I had definitely never seen, or heard of, anything like this before. They appeared to be munching away on the yellow bulbs. I quickly noticed there were also ants surrounding these caterpillars. The ants were not attacking the delicate butterfly larvae, so this had to be some sort of symbiotic relationship between the caterpillars and ants. While I had little idea at the time what I was looking at, my background in entomology was telling me one thing: this was something cool. By this point I had returned to the tree with my colleague, wildlife photographer Jeff Cremer. We took several shots of the caterpillars, ants, and yellow bulbs. This kind of mutualistic caterpillar-ant relationship is known as myrmecophily, and has interested scientists for a long time. Caterpillars belonging to the family lycaenidae have a special structure known as the dorsal nectary organ, which secretes sugars and amino acids. This sweet, nutritious reward is what keeps the ants around and in return, the ants protect the caterpillars by driving off hungry predators and parasitoids. As I was inspecting this bizarre caterpillar-ant interaction, I noticed something flutter just above my head. A butterfly! Not just any butterfly, I could immediately identify it as a lycaenid and it had a distinct yellow spot on its hind wing that looked remarkably like the yellow bulbs. Was this the adult of the caterpillars!? I assembled the photos from the trip and starting emailing the top butterfly experts as well as botanists. The responses I received were mostly along the lines of "I've never seen anything like this before" and "there's nothing published on the life history of the butterfly". Ok, so it seemed like we were on to something new here. With the help of some experts, we were able to identify the butterfly as Terenthina terentia, which belongs to family Lycaenidae. 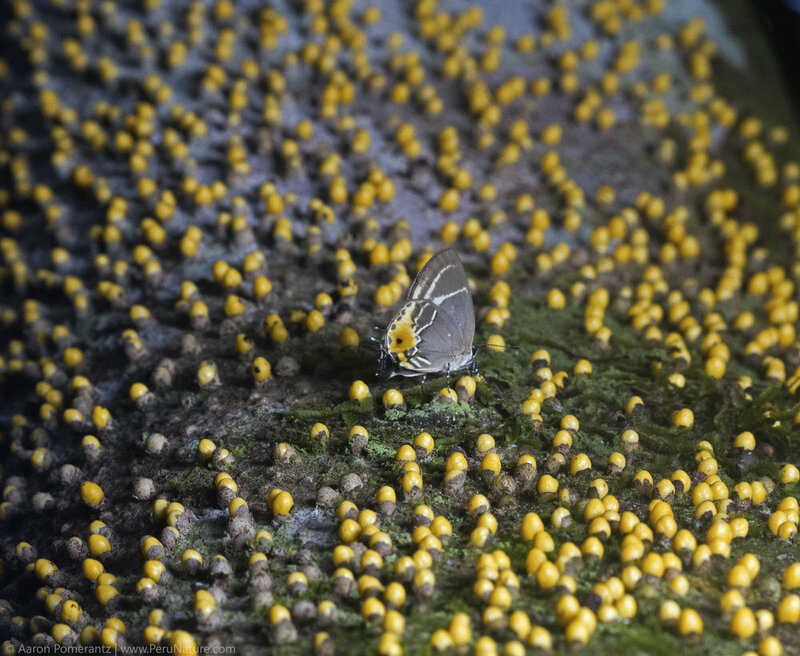 While this family contains around 6,000 species, the Neotropical lycaenids are still only partially known and poorly studied (Pierce 2002). Many species of lycaenids are known to engage in relationships with ants (aka myrmecophily) so our caterpillars definitely fit this criteria. Several botanists emailed my pictures around to their colleagues until we were finally able to ID the yellow bulbs as a "very unusual and rarely seen" parasitic plant belonging to the family Apodanthaceae. Ever heard of that? Yeah, me either. Apodanthaceae is a small family of parasitic plants that live inside other plants and they only become visible once the flowers burst through the bark (Bellot 2014). The species we found is possibly Apodanthes caseariae and there is little known about their ecology, what pollinates them, or how they infect their host plants. Our observations appear to be the first record of an insect utilizing Apodanthes as a host plant. The strange yellow bulbs of this plant appear to emerge once a year around October through January and then fall off. Although this species of butterfly, Terenthina terentia, was described over one hundred years ago, we knew essentially nothing about how it lived its life until now. In other words, we helped to described its life history by documenting the larval stages, host plant, and ant-associated behavior. By observing and studying this complex relationship, we can gain more insight into the diverse array of biological interactions in the Amazon rainforest. However, our work is far from over and many questions still remain. Is this the butterfly's only host plant? How does it know when the parasitic plant is emerging and how does it find the yellow bulbs? What purpose does the butterfly's yellow wing spot serve? We'll attempt to continue to pick apart this fascinating Amazon mystery which will undoubtedly result in even more questions! Special thanks to colleagues in and out of the field who assisted with this project, especially Jeff Cremer, Frank Pichardo, Chris A. Johns, Phil Torres, Christie Wilcox, Jason Goldman, Nadia Drake, Trevor Caskey, and Alex Gardels. Thanks to Andrew Warren, Alex Wild, Naomi Pierce, Adrian Hoskins, Sidonie Bellot and Robert Robbins for help with insect/plant identifications and expert input.